The Football Association is set to begin a hunt for a new England boss to succeed Sven-Goran Eriksson, who will stand down after this year's World Cup. Bolton manager Sam Allardyce is the early favourite for the post. Also linked are Middlesbrough's Steve McClaren, Alan Curbishley of Charlton and former Celtic boss Martin O'Neill. Ex-Bayern Munich boss Ottmar Hitzfeld and Australia coach Guus Hiddink are among the foreign candidates, along with Portugal boss Luiz Felipe Scolari. Former Scotland coach Craig Brown believes Motherwell manager and former England defender Terry Butcher should succeed Sven-Goran Eriksson as England's next boss. Brown told BBC Sport: "There's one name that hasn't been linked with the job and it should be and that's the former England captain Terry Butcher. "He's intelligent, honourable and vastly experienced." Hiddink has one year left on his contract with Dutch side PSV Eindhoven and is combining that role with coaching Australia. A PSV spokesman said: "There is no comment from Mr Hiddink. "It is just a rumour and a media thing in England. "He is a colleague of Mr Eriksson so Mr Hiddink does not have to say anything. He has two big jobs here - to become champions with PSV and going to the World Cup with Australia. "That is his future at the moment." 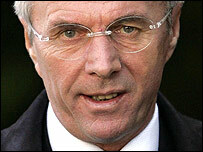 Sports minister Richard Caborn believes the FA should not rule out employing another foreigner when Eriksson departs. Caborn said: "You would like it to be an English or British person but you have to acknowledge that football, and much professional sport, is now global. "If you look at rugby, cricket and tennis they all have or have had foreign coaches as well so it would be wrong to restrict the search just to people from this country. "If we want success, the most sensible thing to do is to employ the best person." But Professional Footballers' Association chief executive Gordon Taylor feels an Englishman should be given the job. He told BBC Radio Five Live: "It should be a chance for an Englishman. "It is a bad reflection on the game if this country - the strongest in the world for football - can't produce a quality coach and manager. "I believe that we have people who have not only played the game but have coached and managed at the highest level and I think it would be nice for them to be given the opportunity. "It's a global game but if we are going to be in a situation where a manager comes and goes, there isn't quite the same feeling for your own country. It is not really what international football is about." League Managers' Association chairman Howard Wilkinson echoed Taylor's view, adding: "My point of view, as chairman of the LMA, is we would hope that English contenders for the position have got more than a head start." Former England coach Don Howe believes finding the right man to replace Eriksson will be difficult. Howe told BBC Radio Five Live the new England manager will have to be "very knowledgable on football and tactically very bright". He added: "He must have the right psychology - some of these lads are millionaires and you've got to be very clever because they have to work hard. "It is difficult to get an experienced man. All the experienced men are in jobs." Earlier this month, Bolton chairman Phil Gartside warned off Newcastle United over speculation they were lining up Allardyce to replace Graeme Souness as manager. At the time Gartside told the Mail on Sunday: "The only way I would be prepared to consider allowing Sam to leave the club - and he has three years left on his contract - is if the England job came up." Following the news that Eriksson is to stand down, a club spokesman told BBC Sport: "Sam is still in his position at Bolton so the club is not making any further comment." Charlton chief executive Peter Varney said on Sunday that the Addicks would not stand in Curbishley's way if the FA come calling after this year's World Cup. Varney told BBC Radio Five Live: "I think any coach would want the opportunity to run the national side and Alan is no different. "Of course he would want it and if it came along we would not stand in his way. Alan is a very focused individual, a very good tactician and I think that is the greatest testament you can pay to him." Who will fill Sven's shoes?